To celebrate the 100th year anniversary of WWI ending the whole school came together to remember. Each child was asked to bring in a plastic pop bottle so the base could be cut off and decorated with red paint to create a poppy. 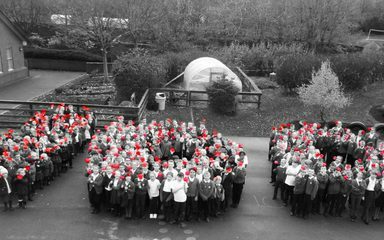 The whole school from nursery to year 6 then came together to form a 100 sign using our poppies.